No matter how sweet the crime, the culprit will get their just desserts. In the quaint beach town of Sunny Shores, Florida, business is booming for the Burger She Wrote Food truck. Kara Summer's decision to quit law school and open her own food truck seemed to be a good one. When a stray cat is chased inside the food truck by Mrs. Watson's prized cocker spaniel, things get messy. Unfortunately for Kara, the town's food inspector, Margaret Pettyjohn, drops by unannounced at the same time. Ms. Pettyjohn decides to temporary shut Kara's food truck down during the busiest time in the summer. A few days later when Ms. Pettyjohn is found murdered in front of a coconut tree on T.J.'s farm, questions arise. Once again, Kara finds herself in the middle of another investigation. Only this time, she is a suspect. 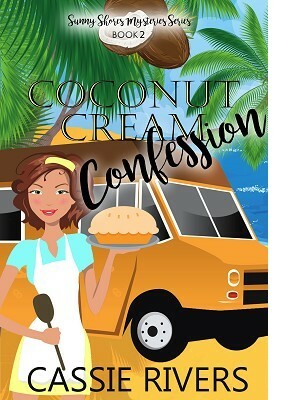 Coconut Cream Confession is book two in the Sunny Shores Mystery series that is set in the fictional town of Sunny Shores, Florida. Each book in the series is a light-hearted and cozy stand-alone story. All ages can enjoy the stories because they have no swearing, naughty content, or graphic violence. So what are you waiting for?